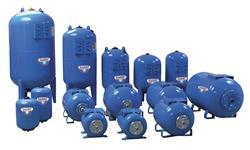 ULTRA-PRO: pressure vessels with a food-grade replaceable membrane. This line is ideal for every modern installation and can be applied to any type of pump. The real volume of the pressure vessel is much greater than normal that of normal tanks of the same dimension with smaller dimensions. A compressor is not necessary since an air cushion, separated from the water by the butyl membrane, maintains a constant pressure in the tank. These tanks can also be provided with stainless steel flanges. Available capacities are from 8 to 3000 liters ( 1.75 to 660 UK gallons). They are certified by the PED 2014/68/EU, WRAS, ACS. This line has specific models made for the Italian, European Community and Extra-European Community markets.